In a 1995 speech, Hugh McColl, Jr. said, “As every school child knows, the dinosaur didn’t survive the Ice Age…. It’s not that he lacked the capacity to evolve. He just didn’t have the time. Unlike the dinosaur, bankers can see the changes ahead. We have a choice in the matter. The dinosaur never did.” The CEO of what is now called Bank of America was speaking to an audience assembled by the Banking Administration Institute, an old-line education and research organization serving the industry. Mr. McColl’s leap from Ice Age dinosaurs to Internet Age banks may have been a stretch. But there’s no doubt that after more than 20 years of change, and innumerable predictions of their demise, commercial banks are bigger and more profitable than ever. Retail banks have held their own despite a declining share of financial assets and successive threats from brokerage houses, national retailers, automobile companies, and even software makers. However, none of the banks’ challengers have put together the combination of customer value, convenience, and trust necessary to be an effective alternative. Banks have been protected mainly by a strong hold over payments, branch banking, and deposit insurance systems, as well as sheer consumer inertia. Today, banks are at another competitive crossroads. This time the new contenders in financial services are telephone companies, specifically wireless telecoms. The banks’ latest challenge is at hand, literally, in the form of the increasingly ubiquitous mobile phone. Unlike early experiments with consumer finance technology, such as “smart cards” and the first PC banking services, which were often based on tortured business logic, underdeveloped technology, and mistaken assumptions about their value to customers, mobile devices look like a natural channel for consumer financial services. The epicenter for a transformation of consumer banking will be the convergence of banking and telecommunications players, as well as Internet service providers and Web portals. The conventional intra-industry consolidation that has preoccupied the telecom and banking sectors for the past few years will run its course, and as it does so, atypical communications and financial services partnerships, aimed at creating new forms of competition, will accelerate. Such convergence is already well under way in Europe, where bank and telecom alliances were announced at a rate of more than one a month in 2000. Asian companies (e.g., NTT DoCoMo Inc.) are also on the move, and U.S. and Latin American firms are poised to venture into wireless finance in 2001 and 2002. Change in the retail financial services sector, triggered by convergence, will be profound. Almost by accident, mobile operators have built networks and technologies capable of making person-to-merchant and person-to-person payments. With this infrastructure, wireless telecoms can attack one of the bank’s greatest, longest-standing strengths — control of the payment system. What’s more, wireless service providers now have the wherewithal to disintermediate credit card associations such as Visa, MasterCard, and American Express. Indeed, mobile devices, with their range of interactive functions and ability to deliver information in real time, have the potential eventually to overpower today’s static plastic credit card. Payments could become a “killer app” for wireless telephony — with coolness, convenience, and low cost the core value propositions. Although the first generation of online financial services was disappointing, the second generation will be far better. This time, more effective technologies will fundamentally alter how financial services are bought and sold — in ways that benefit customers and businesses. Perhaps most importantly, the changes sweeping financial services eventually will affect all forms of retailing. In particular, businesses will have a greater ability to capture and use consumer and merchant information (financial and other) to develop a variety of consumer services that will have a powerful influence on people’s purchasing decisions. What makes the mobile operators’ threat and attraction to banks all the more credible is not technology and marketing, but capital. Telephone companies are under extraordinary pressure to leverage their expensively acquired customer bases. They must also justify their investment in third-generation (3G) licenses and network infrastructure, which will increase the speed with which data fills a cell-phone screen. 3G is a multibillion-dollar bet that eventually will have to be paid for with real revenues. The explosive growth of bandwidth and data-processing capacity is lowering the unit cost of using the technology, and wireless telephone services are already becoming a commodity. In the United States, Booz-Allen expects the growth rates of subscriber and voice revenue to decline through 2005. (See Exhibit 1.) However, this trend is global, and if operators don’t find new retail uses for their expanded capacity, they will suffer significant losses. Thus, telecoms worldwide are in a race to provide content that will generate sufficient revenue to bring them a return on their investments in infrastructure. Media and entertainment are possibilities, but small screens are not a good way to display such content. Entertainment is also a poor fit with the on-the-go usage for which the mobile phone was invented. Consumers are unlikely to rack up big charges to play games by the minute on mobile wireless devices when they can while away their time on a Game Boy for nothing. By contrast, financial content is well suited to the mobile phone. Even though the screen isn’t as easy on the eyes as an ATM or a PC monitor, it’s still large enough for consumers to check balances, pay bills, move money among accounts, and perform just about any other routine banking transaction. As voice recognition and 3G wireless technology develops, accomplishing such tasks on a mobile device will become even easier. Consumers can carry a checkbook anywhere and use idle moments to write checks and tally balances. But what’s missing, and what wireless delivers, is the interactivity to perform transactions on the spot. From the telecom providers’ perspective, financial content is literally where the money is. It is also appealing because a combined banking–mobile communications product is a way for wireless telecoms to move beyond commodity voice services and differentiate their products to improve customer retention in a business with a notoriously high churn rate. Another attraction: Financial information is already stored and transmitted in precisely the form that allows it to be delivered by wireless means. In fact, it is the raw material of the existing telecom franchise. Twenty years ago, Citicorp’s then-chairman Walter Wriston observed that the stream of electrons that carried a bank’s foreign exchange positions via a satellite was indistinguishable from the signal carrying the morning news. Today, a satellite transponder may connect a business traveler via cell phone to his office in New York while he’s paying for a meal in a London restaurant, and simultaneously link his credit card to a bank computer in South Dakota to clear the payment. To some extent, the relationship between telecoms and their customers also mimics the way banking relationships are managed. For example, when telecom customers run up long-distance charges and pay for them at the end of the month, that’s credit management. And because short message services, like the one that is driving the explosion of i-mode in Japan, give telecoms experience in charging for brief phone messages, they’re way ahead of banks at managing small-value purchases. Such micro-payments will be an important part of payment services in the future. Telecoms and financial services have other similarities. Outside the U.S., both industries have histories of state ownership. Although they mainly operate in the private sector today, telecom and financial services are heavily regulated everywhere. In most countries, banking and telecommunications are still undergoing domestic and regional consolidation. Finally, both sectors were early movers in harnessing the Internet to create new business models. Still, the affinities between banking and telecommunications are not enough to guarantee successful alliances. The two must conquer barriers that are as much psychological and cultural as they are economic. A sales pitch based on rational economic efficiency is a supplier’s argument, not something that is compelling to a consumer. Consumers are conservative in their banking habits. Witness the problems of many Internet banks, which are struggling partly because many people either aren’t ready for virtual banking or simply reject it. It may make economic sense to financial institutions to offer full-service online banking without the bricks-and-mortar costs and to attract customers to it with higher returns on their deposits. But consumers want the comfort of knowing they can go to a branch, even if they never visit one. They want to see where their money is kept, even if they never use a teller. And they want to know they can complain to a human being in person, even if they never do. These facts have not been lost on the financial services industry’s old and new leaders. The most successful online securities firm, Charles Schwab & Company, built a network of offices to help drive growth even though most of its customers visit them only once, when they open their accounts. The dot-com brokerage house E-Trade Group Inc., which once touted its virtual purity, is now testing an in-store presence with the U.S. retailer Target. Whereas Internet banks seem to be too great a leap for people to make, wireless finance is a direct and natural extension of the way the typical consumer takes care of finances today. Most people are comfortable banking by phone; paying for a meal in a restaurant, or a shirt in a department store, with a mobile phone instead of a credit card hardly seems a stretch. Retail finance innovations often fail because they require wholesale changes in consumer behavior, as banks have discovered when they’ve tried to cross-sell financial products, and as Internet banks have found in trying to market to customers of Amazon.com Inc. or CDnow Inc.
test-marketed smart cards in the U.S. as an alternative to standard credit cards. But smart cards don’t work without a smart card reader, and these readers are not widely in use. Diana Knox, senior vice president for smart cards at Visa International, told the Industry Standard that it will cost $11 billion to create a smart card infrastructure for everyday commerce. Card issuers would have to absorb $4 billion of the total cost; merchants would carry the remaining $7 billion. Successful innovations in retail finance — think of credit cards and 24-hour ATMs located beyond bank branches — offer more than new technology. They allow people to manage their lives on their own terms. In other words, they complement rather than complicate people’s lives. The mobile phone is definitely in that mold. Today, people usually don’t leave home without their mobile phones, so using the phone as a cashless way to pay for a meal is certainly as convenient as using a credit card. Indeed, of all the players in this emerging scenario, credit card companies may have the most to fear as wireless finance unfolds. Even if it takes a while for mobile devices to disintermediate credit cards, at the very least, credit card suppliers will have to upgrade substantially their current value proposition, which today is limited in functionality and very costly for both consumers and merchants. The limitations of credit cards are familiar. There’s the embarrassment that comes when a consumer’s charge in a store or restaurant is rejected because of insufficient credit. New mobile devices allow people to check balances in real time before making a purchase and to move cash among accounts if necessary. Furthermore, credit cards are easily lost or stolen, and anyone can attempt to use another’s card. Even though individual cardholders are protected from substantial losses caused by unauthorized charges, the costs faced by card issuers are eventually passed back to all consumers in the form of higher interest rates and fees. Like an ATM card, mobile phones could have a unique personal identification number that must be keyed in before transactions can be made, making them a more secure payment vehicle than credit cards. Or consider parents who may not trust their children with either a credit card or large amounts of cash when they shop for clothes on their own. Mobile phones would allow a parent to approve purchases from home or work. What’s more, the benefits of wireless finance can be extended to customers with scant or poor credit histories with less risk to the institution than that incurred by credit card companies. 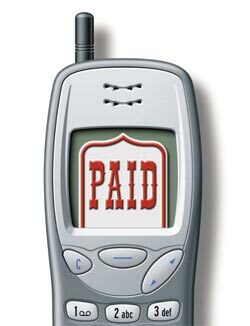 By offering prepaid phone credits or the option to make micro-payments, telecoms can reduce the chance that customers won’t pay their bills. Merchants could save on the processing fees they pay to the credit card associations if wireless operators pass on their lower costs of settlement and clearing. With merchant service fees around 2 percent, there is margin for lowering service fees to compete with Visa, MasterCard, and American Express. Additionally, on the revenue side, the information collected through wireless device transactions can help merchants market more efficiently to high-spending customers. Now, the pervasive use of mobile phones, abetted by common technical standards, promises the rapid adoption of wireless finance. In response to consumer demand (see Exhibit 3), credit card providers and telecoms are conducting a variety of experiments in wireless finance. In the U.K., for example, Visa is conducting an m-commerce (mobile commerce) pilot program that allows wireless phone users to download money to a chip-based electronic purse, a variation on lackluster experiments in the U.S. with stored-value smart cards. In Finland, which has the highest per capita mobile phone ownership worldwide, consumers can use mobile phones to pay for small-ticket items, everything from a car wash to a box of golf balls to sodas from a vending machine. Mobile phone penetration in the United States, at 34 percent, is running well behind that of other industrialized countries. Still, there is ample evidence of a growing American appetite for wireless devices. Witness the plethora of manufacturers introducing devices that combine features of mobile phones and personal digital assistants (PDAs). Furthermore, cashless transactions enabled by digital technology are common enough in the U.S. to suggest more people are becoming comfortable conducting personal business through wireless means. Consider the success of E-ZPass, a small plastic apparatus affixed to a car’s windshield that electronically pays highway tolls as the vehicle passes through tollbooths. The program, which operates in several eastern states, has caught on so fast some states are having a hard time managing demand. Another IT application popular with marketers and consumers is the Exxon Mobil Corporation’s Mobil Speed Pass. Consumers simply wave a small plastic 1 1/2-inch-long “wand,” which hangs from their key chain, at a receptor on the gas pump to charge the purchase to a credit card. Introduced as a pilot program at the pumps, Speed Pass, which uses an automatic data capture technology known as radio frequency identification (related to older and simpler bar coding), can now be used to make purchases in Exxon Mobil gas station convenience stores. Bank–telecom partnerships are also surfacing in the U.S., although they’re still rare compared to their European counterparts. For instance, the innovative credit card issuer Capital One, through its telecommunications subsidiary, AmericaOne, will use its proprietary information-based strategy to identify and test new market segments for the U.S. mobile service Sprint PCS. In turn, Sprint PCS will provide wireless services, billing, and the network infrastructure. Although the immediate focus of the venture is to create business for Sprint PCS, these accounts could become the basis for a fuller menu of transactions, lending, and other financial services offered through Capital One Bank. Spain’s Movilpago venture, between Telefonica and BBVA, is in many respects the prototype of how telecoms and banks can best work together. Movilpago is extremely ambitious. Aiming to reach 100 million customers and 5 million merchants in 30 countries in three years, the venture will try to achieve a scale that took the major credit card companies decades to reach. Unlike the card issuers, however, Movilpago will not have to painstakingly build a customer base, because its mobile phones are already in the hands of the customers. Its strategy is to team up with many telecoms and bank partners, but the telecoms are key because they are the ones that own the wireless infrastructure that will be the backbone of the payment system. Initially, the venture will focus on small-value transactions in traditional, Internet, and m-commerce environments. Its mobile payment methodology allows consumers to make in-store, person-to-person, Internet, and vending-machine purchases. Significantly, implementation does not require specialized Wireless Application Protocol (WAP) or 3G technology. As a measure of how potentially dominating Movilpago could become, it has already been taken to court. A Spanish government tribunal has imposed safeguards against anti-competitive practices reminiscent of the AOL–Time Warner merger. The multinational aspirations of Movilpago point to a novel feature of telecom-led financial services offerings — mobile brands are already substantially international. One telecom company, Vodafone, has interests in mobile communications networks in 25 countries on five continents. Its emerging global brand gives it the power to leverage a bank alliance, thus potentially establishing a larger presence in wireless finance in foreign markets faster than it could on its own. Even though the telecommunications and financial services industries share important traits, they have some fundamental differences that partnerships can help overcome. Telecoms need certain capabilities in order to provide wireless finance services. Those they do not already possess, they can acquire relatively cheaply by allying themselves with banks. For example, in the Movilpago strategy, Telefonica already has a number of the front-end capabilities needed to handle payment transactions at low cost. The link to BBVA supports the necessary credit and payment functions that it did not possess. These are commodity capabilities that can be provided by many banks, and the combination can create competitive advantage. Alternatively, a telecom could build such capabilities from scratch, avoiding the cost of managing old technology, but it would face the steep learning curve of developing new technology. Regulatory factors will also play a role in bringing together players in the two industries, although several regulators have indicated they don’t necessarily see a problem with granting banking licenses to telecoms. In fact, regulators and governments have been pushing for years for increased competition in the payment arena, which will most likely open doors for telecoms. Telecoms will partner with a limited number of banks, from a relatively large number of potential providers. And the sooner banks ally with telecoms to get their share of the wireless marketplace, the better — for several reasons. First, significant new competition will challenge the large margins that are now the rule in the retail banking industry in many countries. Wireless companies will be looking to cross-sell products to their existing customers and those of their partners through relationship-based product bundling and pricing that takes advantage of a reduced cost structure. Even if only a fraction of the anticipated changes materialize, there is enough room in the economic structure of the financial services industry for some players to succeed quite profitably while substantially altering the market share of existing institutions. Second, although today’s converging banks and telecoms seem to prefer joint ventures and other types of strategic alliances, a major telecom could bid for a major bank. Even with market corrections, many telecoms’ absolute market capitalizations and P/E ratios are higher than those of many banks. (Vodafone is now one of the top 10 companies in the world by market capitalization.) Indeed, a union of two mega-players such as Vodafone and Citigroup is not only plausible, but logical. Anticipating the likelihood that telecoms will be shopping for banks, either to buy or to partner with, banks have strong attributes they can promote, including brands that evoke security and reliability, skills in credit management, and physical distribution channels. The right telecom partnership will allow some banks to leapfrog their competitors as the marketplace changes. Banks that move first will gain formidable allies in the fight for market share in all consumer financial services products, both domestically and internationally. The third reason banks should move quickly is that teaming up with telecoms will potentially help banks amortize their investments in online services across a broader, telecom-enhanced customer base. Many banks have invested vast sums in enabling existing businesses for the Web and in launching Internet-based services. However, heroic me-too investments by banks have historically had little success in generating significant profits or creating a long-term competitive advantage. Remember when every bank offered its own credit card? Today, most banks are merely resellers for a handful of special issuers that boast economies of scale. A telecom partnership can help these prescient banks monetize the huge sums they’ve spent on Internet technologies. Fourth, joining a telecom rather than trying to beat one gives banks a hedge against tough new players that are using technology to develop and launch financial product offerings more quickly, and at lower cost, than banks can. For now, wireless newcomers to consumer finance face the problem of acquiring customers and building the requisite degree of trust, but that hurdle will come down as they build infrastructure to increase bandwidth, and build their brands — with or without the help of bank partners. As the entry point for wireless finance, payments are expected to yield substantial profits in their own right, particularly if the incremental cost of the new infrastructure ends up being lower than that of the existing card payment infrastructure. In the U.S., the market prize is an estimated $20 billion of merchant fees and about three times that in credit interest income. Customer acquisition costs will be a key variable as telecoms try to leverage their own, and selected partners’, customer bases. But payments are just the beginning. Once mobile operators can associate themselves in customers’ minds with safe and secure transactions, they will be better placed to go after credit management, deposits, and other banking products. For example, by expanding automated real-time advice capabilities to a broader product set, wireless operators could offer services including negotiating and executing discounts; modifying financial arrangements such as leases, insurance policies, and service contracts when they mature; making available event-linked product and service purchasing; arranging cash and savings reallocations and transactions; and so on. Of course, applications such as these may depend on further developing wireless as a medium for transmitting the human voice, its fundamental attribute. Having complicated interactions with a keypad is more trouble than it’s worth. Fortunately, within a few years, it’s likely that voice recognition technology will be advanced and reliable enough to enable people to speak instructions into their mobile communications device to complete a variety of financial transactions. Imagine a commuter who gets into her car early in the morning and dials into her bank to check account balances, stock positions, and bills due. Throughout the process, she talks to a computer that can piece the bank’s responses together from digitized scripts and process her verbal instructions. Highway safety advocates frown on the idea, but it nevertheless showcases the opportunities. The competition in wireless finance is only just beginning to heat up, and it is rapidly going global. Beyond Asia and Europe, which have been the leaders so far, we expect growing new activity in the United States and in Latin America. Although the first wave of deals has been concentrated among telecom, financial services, and Internet ventures, the shift to wireless finance is sure to have a broad impact on all retailing industries. This change in the retailing environment will accelerate as wireless, voice recognition, and other technologies improve. Voice recognition and interactive Internet technology have the power to tie together a vast system of interdependent retailing that could even create entirely new and more efficient forms of retail services through cross-industry combinations (e.g., airlines, hotels, and car-rental companies). The day is not far away when that consumer in the car might not only check her bank balance but also be reminded by the same system it is her sister’s birthday in two weeks. Then she’d be offered a choice of retailers’ catalogs that she could scan to select and purchase a gift. She could tell her car she’s planning a trip, and an online travel agent could give her a list of flight departure times, airfares, and hotels with availability. She could then make all her reservations and use her mobile phone as an electronic ticket at the airline gate and room key at the hotel. In a real scenario, Fidelity Investments and the General Motors Corporation will team up this spring to offer stock quotes and other financial-markets information through GM’s OnStar in-car communications system. Trading and account features are scheduled to be introduced this summer. Experience tell us the most successful consumer-finance innovations are those that do not just create profit for financial institutions but give people the ability to transact personal business when they want and where they want. A credit card puts an approved loan in their wallet. An ATM puts a bank teller in every corner store, without bankers’ hours. What’s more, they are excellent businesses. Whether making balance inquiries and trading stocks behind the wheel of a car is our future or not, there’s no question that wireless finance, delivered through a variety of mobile communications devices, has the potential to fulfill both institutional and consumer needs on an unprecedented scale. Wouter Rosingh is a vice president with Booz-Allen & Hamilton’s Financial Services Practice in London, specializing in corporate finance and strategy. He is a member of Booz-Allen’s firm-wide Investment Committee and a visiting scholar at the London Business School. Adam Seale is a vice president with Booz-Allen & Hamilton’s Financial Services Practice in London, where he specializes in strategic transformation and e-business for retail financial services companies. He is the leader of the firm’s global/banking/telecommunications convergence research. David Osborn is a vice president with Booz-Allen & Hamilton in Boston, and has 20 years of consulting experience. He focuses on helping retail financial services companies through strategic transformations. Mr. Osborn has extensive experience working with global clients.